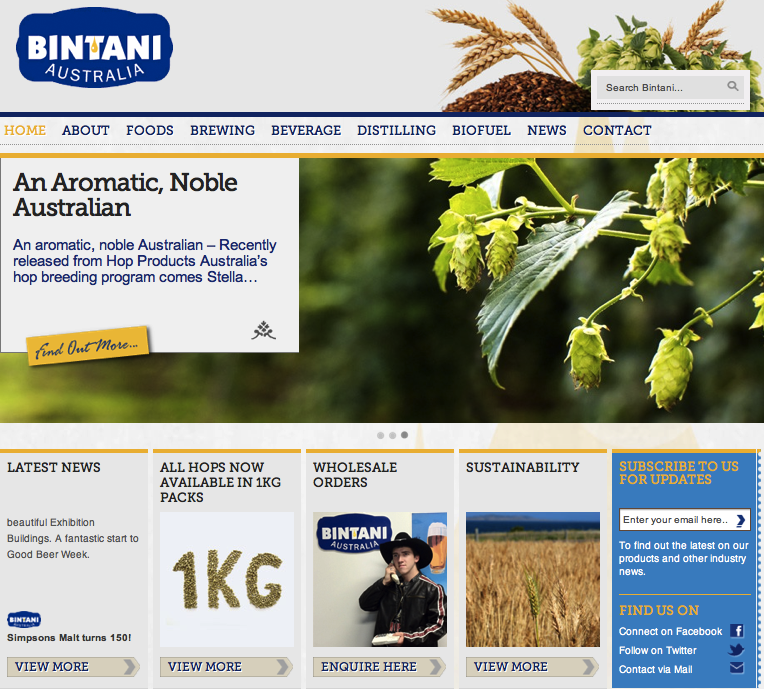 Brief: Build and optimise a brand new website completely modernising Bintani’s B2B hops, food and beer ingredients business online. The Business to Business model was seen as a challenge for Bintani who believed companies did not research the same way online as the consumer market. Also, Bintani wanted to be able to easily update complex, spreadsheet data for their ingredients. Solution: AndMine’s overall goal was to showcase Bintani as the industry leader in Australia across their growing product range. So Our efforts concentrated on building them the finest looking website in their space, while integrating a long term content and SEO strategy that would see Bintani obtain and dominate organic keywords. WordPress was chosen as the CMS and modules were programmed to meet the specialised requirements for the products and social network publishing. Visually, we pushed the website design to compete on an international level, with integrated CSV file uploads to ensure ingredient spreadsheets are presented with sorting and filtering usability. Various SEO techniques were utilised to make the site was highly search engine friendly. Social networks and pages were also developed to produce a wider digital footprint and connected to automated publishing tools. – Client reports a massive growth in business (est. 30%) complimented by offline activities. Go on, see if you can challenge us on "B2B Hops Supplier, Bintani Australia" - Part of our 159 services at &Mine. We are quick to respond but if you want to go direct, test us during office hours.